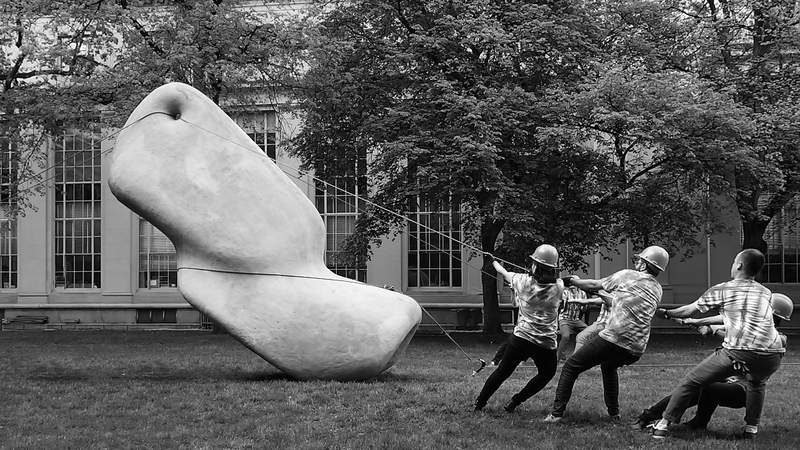 A 2,000 pound sculpture, designed by students at the Massachusetts Institute of Technology, was inspired by millennia-old ancient civilizations who built massive monuments that still mesmerize today. The McKnelly Megalith can be rotated, dragged, and even pulled upright with minimal effort. The engineering behind the structure sheds some light on how mathematics and cunning can lead to incredible feats that enabled pre-historic humans to create seemingly impossible structures. The student team was led by Brandon Clifford, of US-based Matter Design studio, and architectural historian Mark Jarzombek. Clifford’s interest in structures from long ago is what led to the project, which currently sits on a campus green in Cambridge. “There is so much knowledge trapped in these ancient civilizations that we aren’t equipped to handle today,” he says. The Megalith was designed using a digitally-controlled milling machine, which cut large chunks of foam into the predesigned form. Then, the foam was covered with reinforced concrete to give it the weight it needed for the experiments. Students are able to move the one-ton giant across the lawn by shimmying it across cardboard and a small group of people can use a system of looped ropes and counterbalances to pull the structure upright. Related: Could lasers be used to save the Earth’s most important architecture and monuments? “There was a moment of elation when it finally stood up. It weighed more than a car and yet you could move it with a fingertip,” expressed Clifford, who has joined Jarzombek in creating a Megalith Robotics course at MIT. The course focuses on the pair’s combined expertise to study just how ancient cultures performed the incredible feats so long ago which, today, require a higher education to even attempt. The student team was led by Brandon Clifford, of US-based Matter Design studio, and architectural historian Mark Jarzombek. Clifford’s interest in structures from long ago is what led to the project, which currently sits on a campus green in Cambridge. "There is so much knowledge trapped in these ancient civilizations that we aren't equipped to handle today,” he says. The Megalith was designed using a digitally-controlled milling machine, which cut large chunks of foam into the predesigned form. Then, the foam was covered with reinforced concrete to give it the weight it needed for the experiments. Students are able to move the one-ton giant across the lawn by shimmying it across cardboard and a small group of people can use a system of looped ropes and counterbalances to pull the structure upright. "There was a moment of elation when it finally stood up. It weighed more than a car and yet you could move it with a fingertip,” expressed Clifford, who has joined Jarzombek in creating a Megalith Robotics course at MIT. The course focuses on the pair’s combined expertise to study just how ancient cultures performed the incredible feats so long ago which, today, require a higher education to even attempt.